Grace Gutierrez is Counsel in Cummings & Lockwood's Private Clients Group and is based in the Bonita Springs office. Grace focuses her practice on all aspects of estate planning and post death administration of estates and trusts. 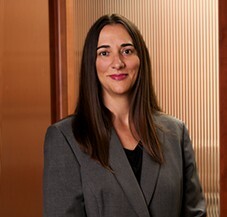 She assists her clients with the development of estate plans, including the creation of revocable trusts and wills, and implementation of advanced estate planning techniques, including the creation of grantor retained annuity trusts, qualified personal residence trusts, irrevocable gift trusts and irrevocable life insurance trusts.